A young girl sailed past me on her bike. This morning was a beautiful morning to be out on the beach-side path, and she was obviously enjoying the sunshine. Her dad followed behind on foot doing his running routine. A hill slowed the girl’s bike down and the girl started to turn to reduce the angle of climb. Her dad caught up with her just at the moment her handle bars started to wobble. 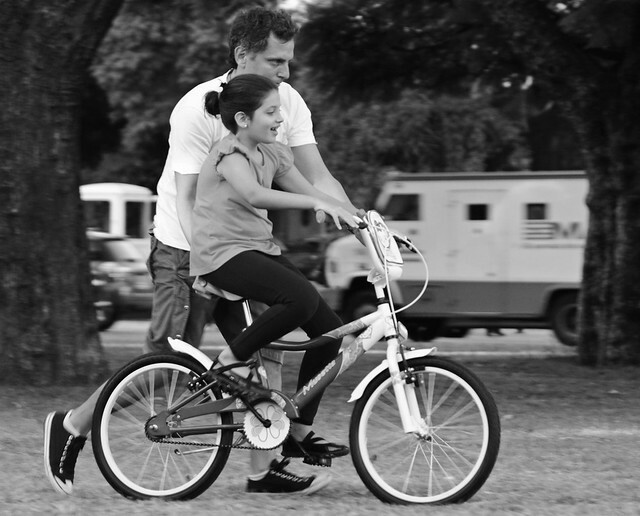 Dad continued to run, but gently put his hand on her back transferring just enough momentum to the girl and bike to re-start her climb. There, I thought, is a good dad. That’s what parenting can be like. Just a gentle encouragement at the critical moment. That girl will grow up remembering that loving pressure on the small of her back, and it will give her strength whenever life begins to be difficult. My local Federal member, Nola Marino, replied to my letter about asylum seekers with the assertion that she was proud of the Coalition’s record in ‘stopping the boats’. It’s true that fewer children (and adults) have died at sea because of the Coalition’s policies, and I remind myself to credit them for that. Each life saved is a victory. However, on the one hand, success in stopping the boats does not solve the problem of displaced people in the region. The Coalition is right: we need to do much more. Australia has a special responsibility in the region because we are wealthy country, and, like it or not, many refugees choose Australia as the place they seek for their new home. But I protest what is happening to real children because of the Coalition’s policies: over one thousand are locked up in less than ideal conditions. By itself, locking up a child is injurious enough. Children should be free. Robbing them of their liberty is a crime humane society should never tolerate. But more than that, Australian Government detention centres are no places for children. They are designed to take away hope from adults. Children in them are not generously fed and clothed. Education is minimal. They do not play; partly because there are no inviting play areas except asphalt pavement in the hot sun, partly because they feel defeated. Children should not be harming themselves. They should not being made sick because of the way we are treating them. As a human being, a father and a grandfather, I cry for these thousand children. As a Christian, I protest against a Government whose policies amount to child abuse. Harsh treatment of human beings is counter-productive. There are difficult policy choices. On that, I agree with Ms Marino MP. But let us proceed by love, not cruelty. I raise my voice with other Christians. #LoveMakesAWay. We sometimes think being a child is something that happens between the ages of three and thirteen, and then it’s over. We’re no longer that child when we become the adolescent and then the adult. We read Erik Erikson’s stages of human development, and think that when we have completed the childhood tasks of trust, autonomy, initiative and competence, we leave them behind. Or we look at James Fowler’s influential stages of faith, and think that when a teenager begins to name their own belief system, they have entered the ‘synthetic-conventional’ stage, and the ‘intuitive-projective’ and ‘mythic-literal’ stages of childhood no longer have any sway in their life. The truth is that we carry each stage with us: it remains important that as adults we attach to people with trust; that we continue to approach tasks with a sense of initiative and personal responsibility. In our faith-life, we continue as adults to find riches in the stories of our faith taken literally and simply, and continue to draw strength from the community’s understanding of God, even as we deepen our own understanding of who the Divine One is. 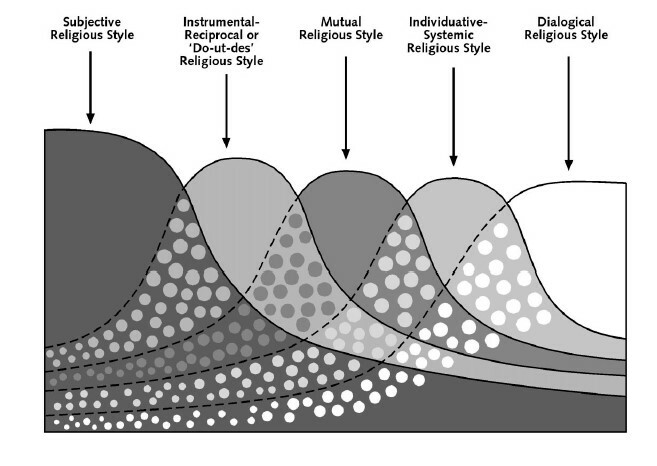 That’s why I like Heinz Streib’s ‘Styles of Development’ in which he shows how different styles of being religious dominate as we develop, but the earlier styles continue underneath – as his diagram illustrates. Our childhood lives in our heads. In my thirties, I was a school chaplain. I deliberately remembered my feelings as a farm boy sent to boarding school to empathise with the boys in my care. In my forties and fifties, my childhood memories crowded my dreams forcing me to make sense of my present life through the symbols of my past. Now in my sixties, I am grandpa for four little kids and I recall my childhood to understand the dynamics of parents and children and grand-children, and work out what I can contribute to their flourishing. If our childhood is still part of us, then we should continue to honour it. We need play. We need nurture. Who we are now is built on the foundation of our childhood, so reflection on our childhood helps us understand ourselves. The characteristics of childhood like its openness are also vital for our relationship with God.